When the average person purchases a piece of diamond jewelry, they will buy a setting that comes with a diamond already mounted in it. What people don’t realize is that there are many benefits to buying loose diamonds and having them set in the jewelry separately. Whether you are buying a diamond engagement ring or a solitaire pendant for a necklace, here are some reasons why you should look into buying loose diamonds for your items. When you buy loose diamonds you are able to better inspect the diamond for any inclusions or flaws that it may have. Some jewelers know exactly how to hide any flaws that a diamond has with the setting. Flaws or chips in a diamond can easily ruin the stone and make it more susceptible to damage in the future. 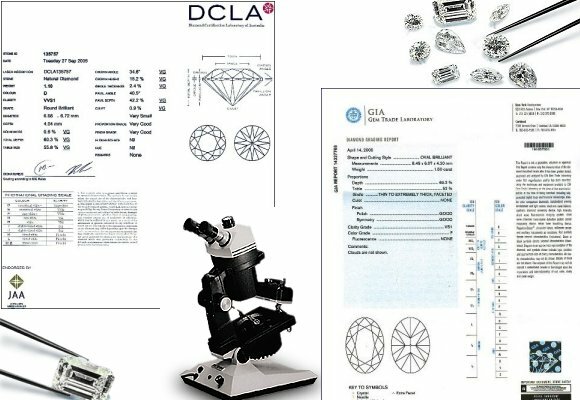 If you were to buy loose diamonds, you could easily inspect the diamond from every angle to find any problems with it. Secondly when you buy loose diamonds for your jewelry, you can pick out your own setting and even customize your setting. You are not restricted to picking the right diamond but not liking the setting or vice versa. You can buy the perfect diamond and then go shopping for your favorite setting after you buy the diamond. This gives a lot more variety from which to choose and also helps your jewelry to be unique and not look like everyone else’s. Lastly, you can save money with loose diamonds. When you set your budget, you can decide how much you want to spend on a diamond and then how much you want to spend on a setting. When you have your budget, you can determine just what kind of diamond you can afford and not have to worry about liking the setting. You won’t have to worry about getting the piece re-set since you are picking your own setting for it. Buying loose diamonds makes a lot of sense if you are looking for a unique piece of jewelry that you want to save money on.